Celebrating 10 years since the opening of its flagship green facility Mihila, Asia’s first CarbonNeutral apparel factory, The Hirdaramani Group this month is again paving the way with the installation of the largest rooftop solar installation in the apparel sector in Sri Lanka. The installations are part of the Suryadhanavi – meaning ‘generated from the sun’ – project by Windforce Ltd. Through its investment in Windforce, this on-going venture in renewable energy is part of the Hirdaramani Sustainability Strategy that focuses on the core pillars of Planet, People, Product and Community, and has seen the manufacturer undergo massive changes to build greener more sustainable facilities across the island. The current installation at Hirdaramani features 21,000 solar panels generating 7.7 MW, leveraging cutting-edge mono PERC modules. 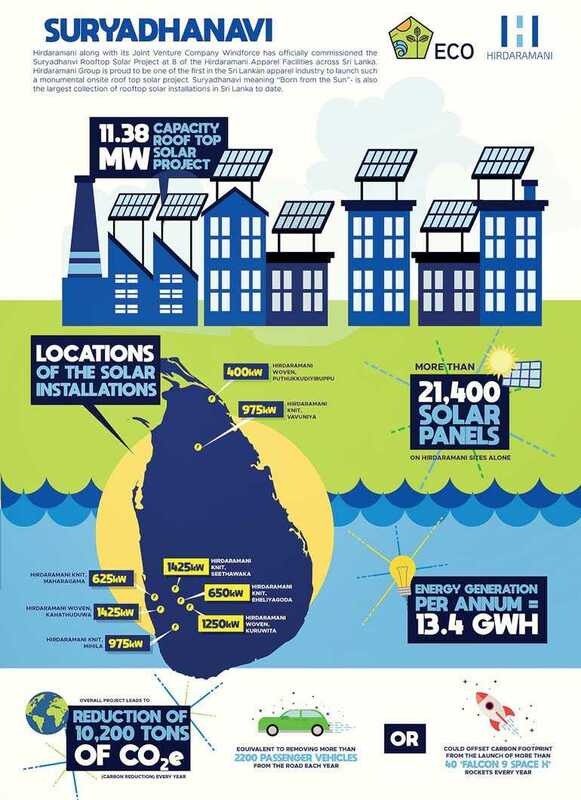 Used for the first time in Sri Lanka by Windforce, PERC modules optimise the efficiency of solar panels by significantly improving light capture; a technology that is rapidly making standard solar cells obsolete. “At Hirdaramani we have consistently pioneered sustainability projects in the apparel industry and in the country. The Suryadhanavi project is an exciting new step in this journey and we are committed to building on the success of these first implementations,” said Hirdaramani Group Director Nikhil Hirdaramani. “With growing pressure on the environment, we understand the importance for leaders of industry to set the right example and invest in greener more sustainable manufacturing and processes thus creating an impetus for change,” he added. “The Suryadhanavi project holds strong potential for further expansion and for making a significant contribution to the nation’s energy security. The world is fast moving towards adopting renewable energy and we are proud to be at the forefront of driving this change. The support of companies such as the Hirdaramani Group makes these changes all the more viable,” said Windforce Ltd. Managing Director Manjula Perera. “Hirdaramani is an organisation that believes in driving positive change while encouraging and empowering employees and businesses to think in a new way. We are thrilled to be part of this mega project driven by Windforce that will see solar installations spreading across the island making a real impact on the energy security of the country while drastically cutting carbon footprints across industries,” added Hirdaramani.